EXCELLENT PRICE in PRESTIGIOUS DUNBAR LOCATION. Fabulous QUALITY CHARACTER HOME built by renowned builder. Over 2820sq.ft NEW HOME WITH SOUTH FACING. This home simply offers supreme finishing to the highest standard. Main floor features an open concept, extensive use hardwood floor thru-out, large entertainment sized gourmet kit with antique look cabinetry granite counter, high-end appliances: SUB-ZERO FRIDGE, WINE FRIDGE. Total 5 generos bedrooms, 4.5 baths, and radiant floor heat system. Potential 2 bedrooms suite in lower level as mortgage helper. 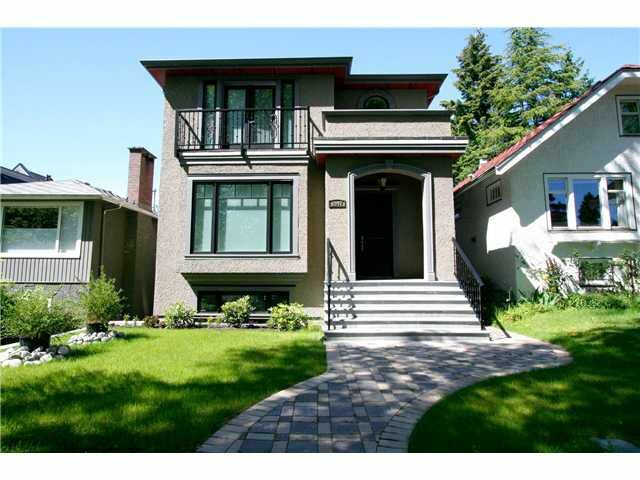 CLOSE TO LORD BYNG HIGH SCHOOL & QUEEN ELIZABETH ELEMENTARY, WEST POINT GREY ACADEMY & ST.GEORGE'S PRIVATE SCHOOL, UBC, SHOPPING, BUS. DON'T MISS! 西區DUNBAR區環境優雅。地大33x122（4026尺）室內面積約2,824尺，由著名發展商精心打造，做工精細，時尚簡約裝修風格。5房4.5浴。近名校LORD BYNG中學 和QUEEN ELIZABETH小學，WEST POINT GREY, ST.GEORGE’S 私校，UBC 。高樓底，開放式客廳餐廳及廚房擁有完美採光以及搭配簡約燈飾，給人感覺視線開闊，寬敞明亮。廚房配有花崗岩櫥台，SUB-ZERO 冰箱，以及紅酒冰箱。優質實木地板， 中央冷氣，HRV，配有地熱！樓下2房單位可分租。購物及交通方便。DUNBAR區不可錯失家庭屋。請約看!